It is both a physical and a mental act. 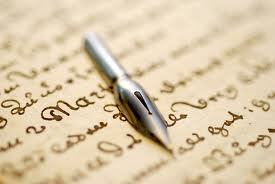 At the most basic level, writing is the physical act of committing words or ideas to some medium. Whether it is hieroglyphics inked onto parchment or an e mail message typed into a computer On the other hand, writing is the mental work of inventing ideas, think about how to express them into statements and paragraphs that will be clear to a reader. Its purpose is both express and impress. Writers typically serve two masters; themselves and their own desires to express and idea or feeling, and readers also called the audience, who need to have ideas expressed in certain ways, writers must then choose the best form for their writing – a shopping list, notes from a meeting, a scholarly article, a novel, or poetry are only a few of the choices. Each of these types of writing has a different level of complexity, depending on its purpose. It is both a process and a product, the writer imagines, organizes, drafts, edits, reads and rereads. This process of writing is often cyclical and sometimes disorderly. Ultimately, what the audience sees. Whether it is an instructor or a wider audience, is a product an essay, letter, paragraph, story or research report.